There are lots of fishing seasons and ways to go fishing. In some parts of the world right now it’s ice-fishing season, but in others it’s open water season. In some places it’s crappie season, in others it’s perch season. In some places we go spinner-baiting for bass or jigging for walleyes. Wherever you live and fish, I think that much of the time it’s good just to go fishing. Don’t get locked into a particular fish or technique, just go fishing. Here’s what I mean. When we leave the house to go fishing, we usually have a species of fish in mind that we’d like to target, and we also probably have an idea of the technique that we’ll start with to catch that species. If we’re after walleyes and it’s early in the year, we’ll probably lean toward jigs. If it’s summer, spinners or crankbaits will generally get the nod. The same is true if largemouth bass are the target: The time of year will help us decide what type of bait to use. However, sometimes the fish break the rules. They’re not really breaking the rules, they just don’t know what the rules are. As anglers, we, on occasion, think we know more about what the fish want than they do, and often, we do. There are times though, when the fish are behaving differently than we anticipate. When this happens, it’s a good idea to change our plans. If our target was walleyes, but the walleyes don’t want to get caught, it’s time to just “go fishing”. I’ve done that many times in the past number of years, and almost every time it’s been a good and productive idea. In the summer, oftentimes we go fishing for walleyes. We’re often successful at finding and catching them, but sometimes things don’t work out. When this happens, we switch species, and frequently the species we switch to is largemouth bass. Here in the Midwest we have some outstanding bass fishing. If the walleyes aren’t biting, the bass usually are, and I would much rather catch a bunch of bass than not catch any walleyes. When we make the switch from walleyes to bass, we’ll often start throwing a crankbait on the weedline, and that will usually work: Usually but not always. When the bass won’t eat a crankbait, we’ll often tie on a plain jighead and tip it with a Strike King Ocho plastic worm. Not many bass can resist a jig/Ocho combination. And again, I would much rather catch’em on an Ocho than not catch’em on a crankbait. I guess what I’m suggesting is this: We should do what it takes to enjoy our fishing as much as possible. Most of us want to catch some fish, and the more and the bigger the better. Spending time with friends and family and enjoying the surroundings is certainly a very important part of fishing, but catching fish adds to that experience. It adds a lot. If you truly enjoy catching a particular species of fish using a particular technique, go for it. But I truly believe most people are happy catching just about anything that pulls back by using whatever technique necessary to make that happen. I know that most of my fishing partners do. What I’m suggesting is that much of the time, we’ll enjoy our fishing more if, instead of “going jigging for walleyes” we just go fishing. 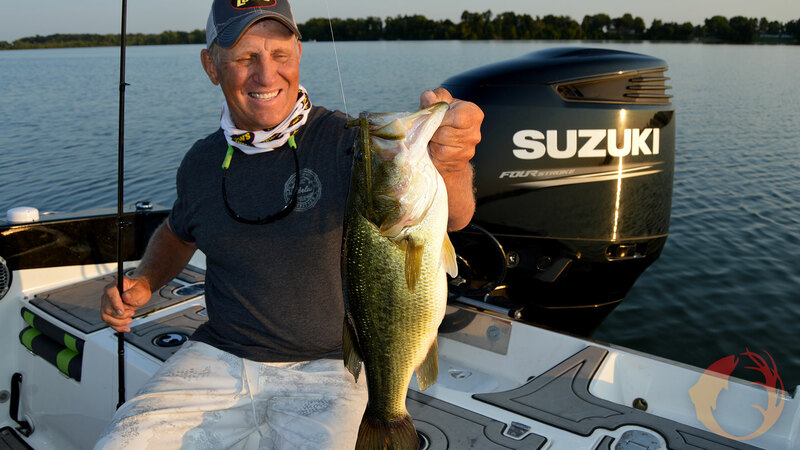 Feature Photo: Mike Frisch with an Ocho-caught largemouth. The bass wouldn’t eat a crankbait on this day, but they sure liked the Ochos.